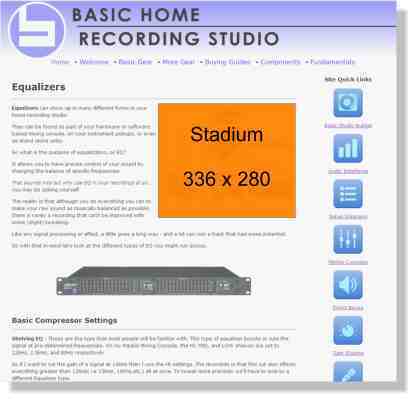 Basic-Home-Recording-Studio.com has been growing significantly over the last year. Most of the ads seen on the site are hosted by Google and I believe they provide good, relevant content to my visitors. I'm proud to provide web advertising to those in the music industry who are seeking to reach out to my home studio interested visitors. I believe this is a valuable resource to the beginner, but by no means is this a comprehensive site industry wide. By using this site in your advertising campaign you are able to reach out to a highly targeted audience of fellow musicians. There are 2 ad formats to choose from, and which one you choose will also determine the placement of the ad. On a case by case basis I would consider a deviation from this format, but due to the site layout this is best for the experience for my visitors. I will only place 3 ads total on any given page. This is simply a decision based on the amount of content and whether or not the placement of additional ads would clutter the layout. With a large format size of 336 pixels wide by 280 pixels tall, this ad provides a big target for prospective customers' eager eyes. This format provides enough space to display an ad that will attract attention clearly and effectively. Typically these appear at the top of the page as shown, but can also be included elsewhere upon request. These can be placed on any page throughout the site, although the exact placement may vary depending on other factors of the page layout. Measuring in at 160 pixels wide by 600 pixels tall, it's lofty and mighty like a true skyscraper should be. 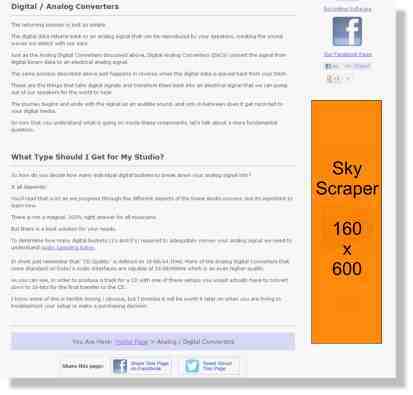 It is placed on the right side margin of each page under the standard quick link navigation buttons. Only pages with sufficient content are eligible for this type of advertisement, as opposed to the stadium format which can be used on any page on the site. The previous 2 flavors can be shown on a page-by-page basis. For those who want to provide maximum exposure across the board, the site wide ad may be for you. This is also in the skyscraper format, but will occur on every eligible page throughout the site that is large enough for a side skyscraper-style banner. This is approximately 45 of the 85 pages that constitute the overall site. In order to place an ad on the site, please send an email to david@basic-home-recording-studio.com with the subject line Advertising. I can also be reached via messaging me on the Facebook page. Check out this page itself or the graphics above to see samples of the types of ads available.